Looking to add a professional and durable finish to your cabinetry? Häfele has just what the doctor ordered. 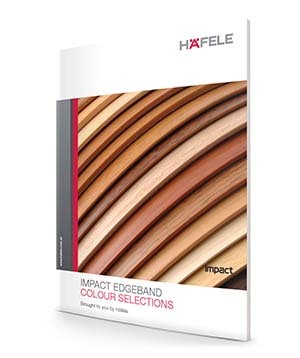 The Impact Edgeband range from Häfele is ideal for cabinetmakers, furniture makers and shopfitters, alike. With over 200 ABS solid and printed colours, plus an extensive choice of multilayered timber veneers, the range has a solution for just about every project. It’s just one way you can add value without the extra cost in time and money. Easy to install and highly durable you can choose edging material in 19, 22, 29 and 38mm widths, and 0.8, 1 and 2mm thickness. Plus, you can also access to a range of hot melt adhesives and their characteristics to help you determine the best solution for your application.